A little personal note before we get started: I know Israel-Palestine stuff is touchy, and while I’m not going to shy away from discussing a few of the political aspects of the Jerusalem light rail (because planning is ALWAYS political, dammit, but especially in the Holy City), I’m going to try to keep this mainly about technical aspects. Other disclosures: I spent two years living in Jerusalem (in 7th grade, and a gap year after high school), but I haven’t been there in nearly six years, so I haven’t actually seen the existing LRT system in operation. That being said, this blog is the “Itinerant Urbanist” for a reason, and my time in Jerusalem represents part of that itinerance (Chrome thinks that’s not a word, but I do). The city has been a major influence on my own planning ethos of walkability and density done well, which is not to minimize its massive social problems and inequities, which are undeniable regardless of your politics. As you can see from the map, the line will, rather hilariously, be known as the Green Line. For those who may not be familiar with the intricacies of the Middle East, the term Green Line in Israel-Palestine discussions usually refers to the pre-1967 (and still legally important) border between Israel proper and the West Bank. The Green Line runs through modern Jerusalem, more or less dividing its Arab and Jewish neighborhoods from each other, though several Jewish neighborhoods developed since 1967 lie on the West Bank side of the line–including the Gilo terminus of the proposed Green Line and the Pisgat Ze’ev/Neve Yaakov northern terminus of the existing Red Line (which runs right along the dividing line in other areas). Israeli policymakers have rarely been accused of subtlety or political correctness. But I digress. The route will extend from the southern extremity of the Gilo neighborhood to the French Hill neighborhood and the northern edge of the Mt. Scopus campus. On the way it will pass through Dov Yosef street, the Pat intersection, Herzog Street, the Bayt interchange, bisecting the campus of the Hebrew University in Givat Ram, the area of the entrance to the city, Shazar Boulevard, Nordau Boulevard, Sarei Yisrael [the princes of Israel] Street, Bar-Ilan street, Harel Brigade street, Zalman Shragai street, Levi Eshkol Boulevard, until the campus of Hebrew University at Mt. Scopus. Additionally, the line includes a branch to the business district in Talpiot which passes through the area of Ha’Parsah Street, Pierre Koenig street, Ha-tnufah street, and Rivkah street, at a length of 3.1 km. If this seems like a route of rather extreme complexity just from the sheer variety of streets it runs on, well, yes and no. Jerusalem has got to be among the world’s least-gridded streets, and the route definitely reflects the curviness of the roads. But it also passes along a particular hilarity of street naming in the city (and elsewhere in Israel): many of the roads change names every 2-3 blocks despite full physical continuity. Just in the above paragraph, Nordau Boulevard and Sarei Yisrael Street are actually the same road, which also becomes Shamgar Street for one block before the line would turn onto Bar-Ilan (which then magically turns into Levi Eshkol Boulevard). My theory has always been that post-independence Israel authorities named streets this way to honor as many ancient and contemporary luminaries as possible (you could get a pretty good course in Zionist history just from looking up names of these streets), but it’s confusing as hell in real life. But anyhow…the Green Line. The line will intersect with the Red Line at two points, near the central bus and future HSR station, and near French Hill. It is expected to carry 140,00-145,000 passengers per day, fairly close to opening expectations for the original line, which now carries about 150,000. 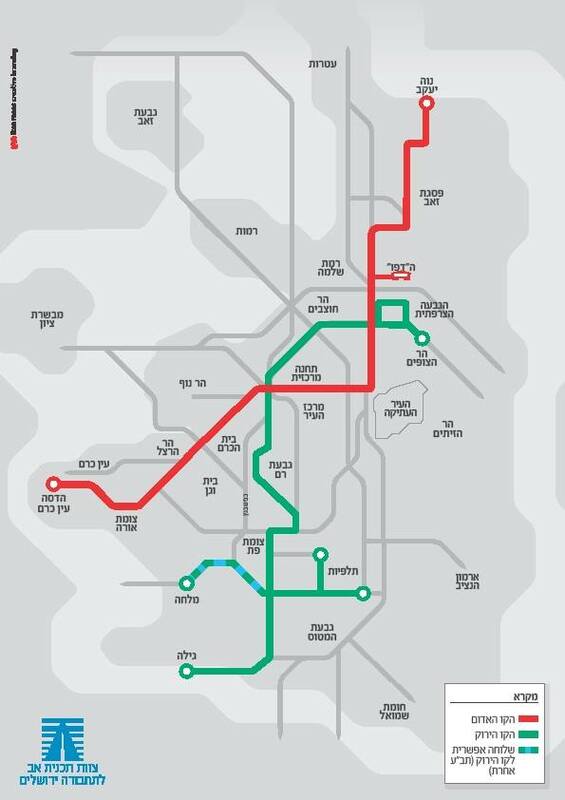 By the time the Green Line opens, the Red Line will also be extended to Hadassah-Ein Kerem Hospital, or close to it. I highly suggest viewing that map with a background other than Google’s default. This is just a best guess of the route; there are a couple of areas where things don’t quite make sense to me, and I’m sure more will become clear over the coming years (the line is rumored to be theoretically scheduled for completion in 2021, but the first line was well behind schedule, so we’ll see). @sandypsj Oh, God. The branching. It hurts. On the left (west), another possible future branch splits off and leads to the Malcha area, home of Jerusalem’s largest mall, a major stadium, and the station that serves the current, Ottoman-era, slow-as-hell intercity rail service. I have no insider information on what exactly is going on here, but I think that this is probably the beginning of an east-west shuttle route between Talpiot and Malcha that could then be extended in both directions; I sure hope it’s run that way and not as a branch off the main trunk. It’s possible (probable?) that these branches will use the right-of-way of the old Ottoman railroad, which is currently either a path or a junkyard, but who knows. Frankly, this isn’t the route that I thought would have been next on the city’s or government’s list of priorities. Connecting the two Hebrew U campuses makes sense, and the areas between them are mostly extremely dense. Gilo is big, but it’s remote and there are long stretches without much density between it and the rest of the city–a legacy of Gilo’s siting across the Green Line and the presence of the once-split Palestinian village of Beit Safafa in between. Between Givat Ram and Gilo, the line is curvy and avoids the densest neighborhoods, with the exception of a brief stretch across Yaakov Pat street. As a former resident of Talpiot, I suppose I’m biased, but for me the natural next line in the network would have run either down Derech Chevron (Hebron Road), the major arterial through southern Jerusalem, or down the old railroad ROW to Malcha. 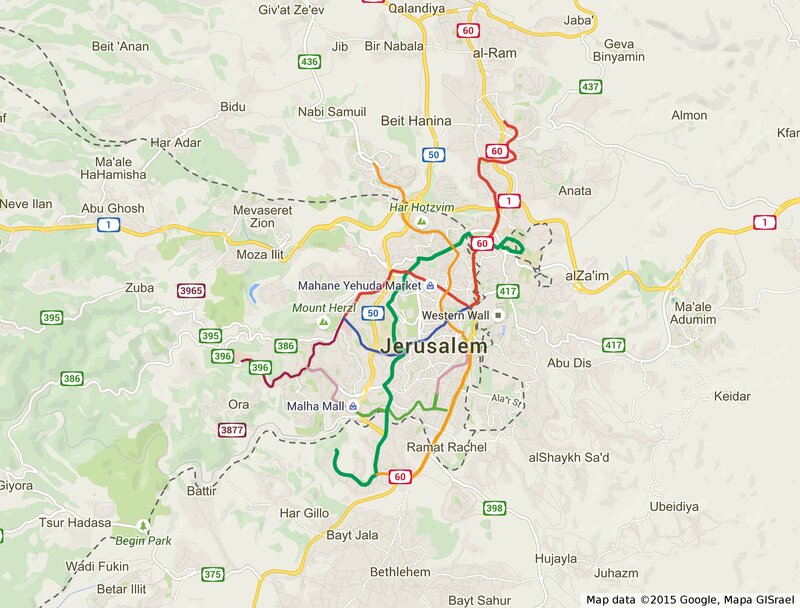 Before going forward, I should recommend that anyone who doesn’t know the city look at the Jerusalem Bus Map on Oren’s Transit Page–believe it or not, there is no “official” bus map even in this heavily bus-reliant city. Derech Chevron is bustling bus route with dedicated lanes in part that host local buses, express buses to West Bank settlements, and shared-cab and jitney services that largely serve a Palestinian market. Derech Chevron doesn’t extend all the way to downtown Jerusalem or to a link with the original line, so there are complications in hooking up a potential LRT line down it, but it does seem to be the most natural alignment for a second line. The rail ROW, too, runs parallel to a busy bus route (Emek Refaim) and while it’s not particularly well-integrated into the city west of the intersection with Pierre Koenig, it offers the promise of much faster trip times on a grade-separated ROW and is anchored on a major traffic generator in Malcha. This is already a really long post, so I’ll leave that here for now and perhaps discuss it more another time. As I said before, it’s impossible to discuss planning issues in Jerusalem without getting into politics. I will confess to using terms for Jerusalem (“the city,” etc) that might elide the area’s political and social complexity. Despite the rhetoric about an “eternal and undivided Jerusalem” that consistently emanates from both the Israeli and American Right, what exists today is undeniably a divided and inequitable city. Among other basic services, the transit systems in Jewish and Arab neighborhoods are almost wholly separate, so I’ve been considering here only the transit network in Jewish Jerusalem, often referred to as “West Jerusalem.” Even that doesn’t fully capture the complexity of the situation, as the Red Line runs through the Palestinian refugee camp of Shu’afat, and the Green Line will pass through Beit Safafa, but it’s a start. People pushing streetcar projects in the US like to talk about the psychological important of the “permanence” of rails in the ground as opposed to bus stops that can be “easily moved.” There is, I think, a weird kind of parallelism to the “facts on the ground” approach long espoused by the Israeli settlement movement; in any case, a few years ago Alon translated on his blog a piece by Shalom Boguslavsky that captures some of the application of that approach to the initial siting of the Red Line in Jerusalem. I think Boguslavsky might be a little too politically deterministic, but let’s not forget that–conscious or not–there are always political statements behind the siting of infrastructure improvements in Jerusalem. Whatever improvements the Green Line or any future LRT network might mean for residents of Jerusalem, we shouldn’t forget the crying need and increasing inequity that infects the rest of the Holy City. It’s been a busy few weeks. As part of my internship with the Tri-State Transportation Campaign, I’ve had the opportunity for my writing to show up in a couple of other places. With the push on to fund the MTA capital plan, I had a piece in the Gotham Gazette about the need for political leadership to make a new plan happen. “Lead, dammit” is of course a cliched, boring thing to ask of lawmakers, but I think there’s some decent blame to be spread around here. And I make the argument that while the MTA is not sliding backwards into the 1970s, it may very well be slipping into the same kind of death spiral as WMATA is currently experiencing. I also had a two-part series on Tri-State’s own Mobilizing the Region blog about the Capital District Transportation Authority’s BusPlus “Bus Rapid Transit” system, existing and planned. Originally written as one long post, it (correctly) got split into two to keep lengths manageable. The first post is a primer on BusPlus, including the existing line from Albany to Schenectady and the planned routes to UAlbany and Troy. The second (and for me, more interesting) post is about what various stakeholders can do to make BusPlus a truer BRT system. I also have several posts coming up on Mobilizing the Region, including one about the economic impact of the MTA capital plan on Upstate that should be going up in the next few days. I’ll also be taking a look at the Capital Region MPO‘s long-range visioning plan and their just-getting-off-the-ground study of the future of the I-787 corridor along the Hudson waterfront. 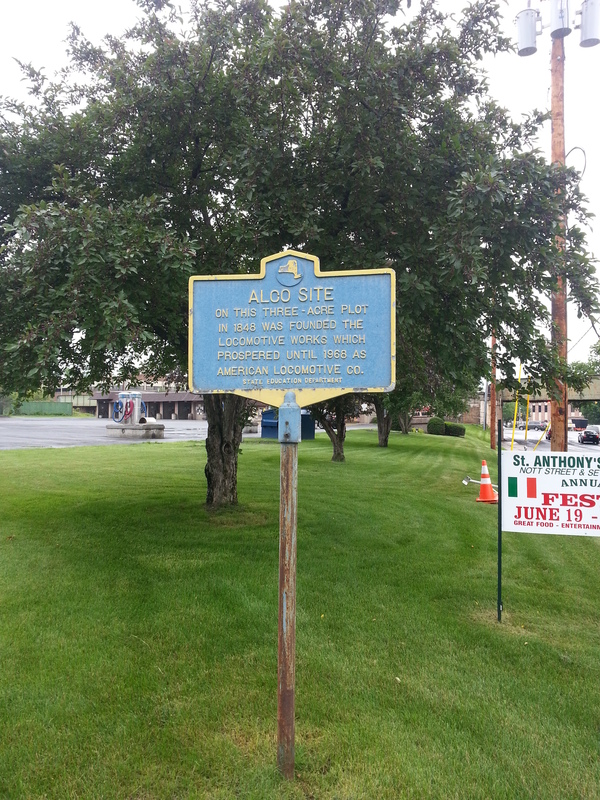 The original site of the famed American Locomotive Company is now a carwash. 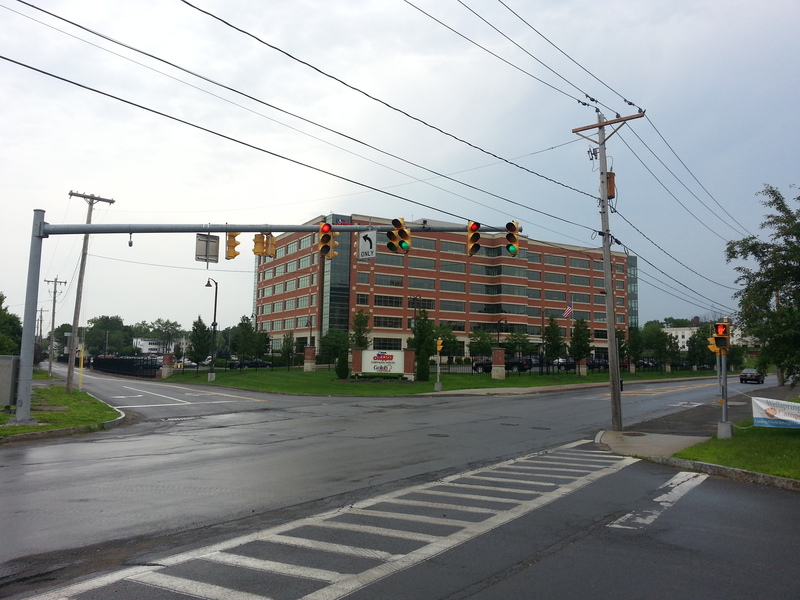 The headquarters of the Golub Corporation, a major brownfields project, has won multiple environmental awards, including LEED certification, despite being fairly anti-urban and surrounded by parking lots. Like many colleges in urban areas, Union is busy buying up all the property adjacent to campus it can get its hands on. 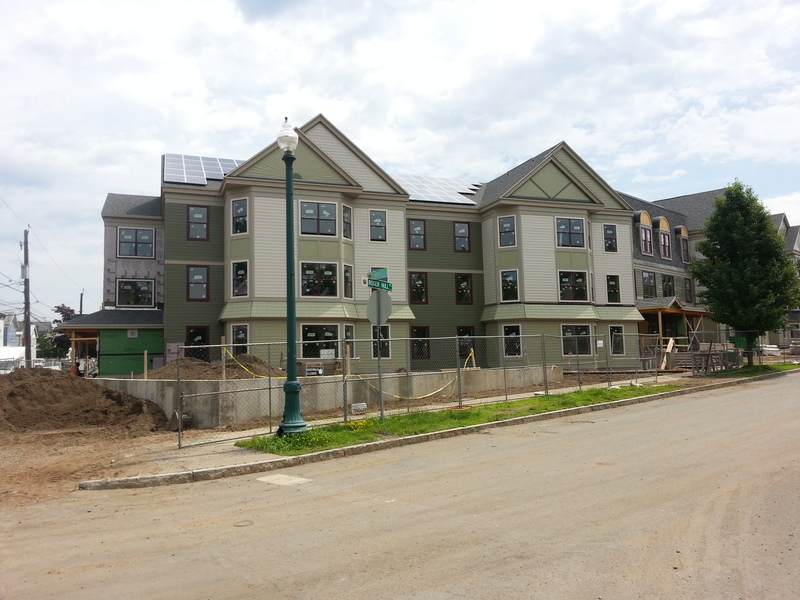 Our guide described this teardown and new-build dorm at the corner of Roger Hull and Park Places as a “revitalization project” for the neighborhood. I have mixed opinions on this. 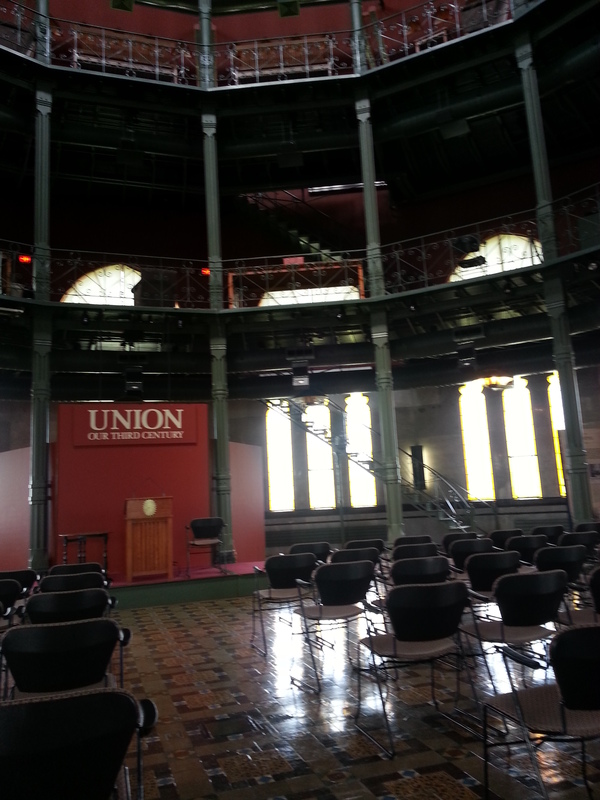 The interior of the unique, sixteen-sided Nott Memorial, the centerpiece of the Union campus, is really something. My picture certainly does not do this gorgeous building justice. Is the Transit Coalition Fracturing? Classy? How about #WorkingClass, @TheWeeklyNabe. You know, the people who make it possible for the trustafarians to enjoy this city. We represent one side, @philipneumann and that is our members. Can't be bipartisan in an adversarial disciplinary process. Nevermind that, of course, in New York City as elsewhere people killed in traffic are disproportionately poor and of color. The ugliness has led to an increasing fracture between labor and the city’s broader progressive/alternative transportation community. Erstwhile allies like Tri-State Transportation Campaign (full disclosure, I’m interning with them currently) Executive Director Veronica Vanterpool (a former bus driver herself, albeit not in the city) have called out the union for its tactics. A few days ago, Local 100 gathered a coalition of other unions to support its campaign for an exemption from the Right-of-Way Law. Until now, though the issue has been gaining increasing media attention, it has stayed largely within a fairly insular circle of wonks and transportation advocates. 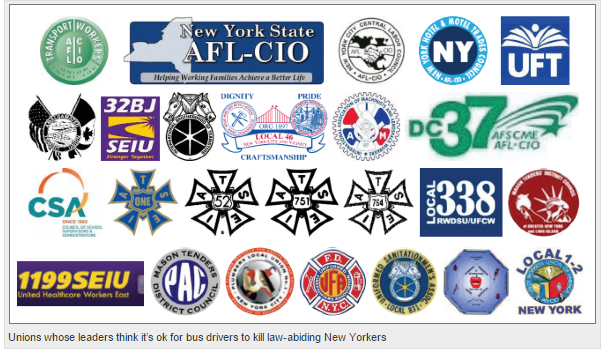 With the involvement of major unions such as those listed above, the Vision Zero conflict threatens to break into wider consciousness. And that’s a particular issue because for the last 60 years organized labor has played a major role in the coalition pushing for stronger transit in the US. In an example I’m choosing mostly because it’s one I have researched extensively, construction unions played a key role in Philadelphia’s decision to build the Center City Commuter Tunnel (although admittedly, the opening of the tunnel played a role in open conflict between SEPTA management and the operating unions, but that’s a different story). Now, with TWU Local 100 playing the leading role in helping labor choose solidarity with itself over solidarity with the broader progressive movement, the coalition that has traditionally supported transit in this country threatens to fall apart. @sandypsj @miller_stephen They're a significant obstacle towards quality transit due to demands for high operating and capital costs. @sandypsj @tanzoak @miller_stephen They're also major parts of the anti-modernization coalition, even when there are no direct layoffs. There’s no doubt that labor has stood in the way of some needed innovations in American transit–operational techniques and technologies that are in wide distribution even in heavily-unionized European countries. At the same time, labor still offers unparalleled organization and muscle for getting out the vote and building support for transit, qualities that a new transit coalition will be hard-pressed to find elsewhere. There is a tipping point, though, at which labor’s embrace of regressive politics and often Luddite approach to technological innovation outweighs its contribution to the transit coalition, and if we’re not there yet, clearly many feel we are heading in that direction. There’s more than a whiff of Monty Python to the TWU/safe streets fight. As Brian so futilely tries to point out to his struggling comrades, there’s a common enemy here, and that’s American car culture and the wasteful and unsafe spending on roads and highways that it gives birth to. It’s worth remembering that Life of Brian was in part intended to satirize the fractious politics of the British Left, whose inability to come together got them massacred by the Romans (or rather by Margaret Thatcher, I suppose). At this point, it’s hard to anticipate a labor-transit wonk reconciliation. But if break up we must, can we at least try not to condemn the future we once could have built together? If We Can’t Kill The O’Hare Airport Connector, Can We At Least Make It Useful? Emanuel has made repeated statements recently that Chicago should try again to launch a nonstop express passenger rail service between downtown and O’Hare, patterned after the premium express trains that for years have been operating between airports and city centers in Europe and Asia, including London, Tokyo, Hong Kong, Paris and Copenhagen, Denmark. 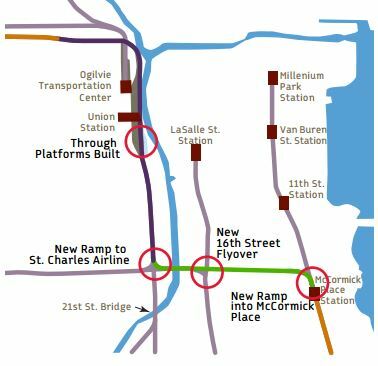 The proposition of a new airport connector is, if anything, somewhat more absurd in Chicago. Chicago already boasts one of North America’s premier rail-airport connections, with the Blue Line running directly into a terminal at O’Hare (sometimes a little too far) and the Orange Line terminating at Midway (though a decent, somewhat inconvenient walk from the terminal). Sure, riding the Blue Line from the Loop to O’Hare is kind of slow, but riders are already seeing results from CTA’s nearly half-billion-dollar rehab project, and it’s generally faster than the amazingly clogged Kennedy Expressway regardless of time of day. So no, Chicago doesn’t need a new airport connector so much as the city’s business elites are seeking to hijack the planning process and spend the city’s limited infrastructure resources on a luxury item for themselves (seriously, just check out the prices for comparable airport connectors listed in the Hilkevitch piece). But at least someone powerful is vocally advocating for new transit in Chicago. Is there a way to harness the energies of the business elite and yoke them to a plan that could benefit the city more broadly? One plan that seems to be emerging along those lines is the CrossRail Chicago proposal pushed by the Midwest High-Speed Rail Association. At first glance, the CrossRail Chicago marketing plan appears cringeworthy in the same elite-focused way as other O’Hare express proposals, selling the project as bringing “New, electrified express trains linking O’Hare to the Loop, McCormick Place and the University of Chicago.” Can you imagine a more business class set of destinations in Chicago? Underneath the elite-focused language, though, there’s an element of significant promise to the CrossRail plan that deserves some attention from business elites and transit advocates alike. With this–relatively uncomplicated, although somewhat capacity-constrained–core connection made, the rest of the regional network, which would serve both local and intercity services, could be built out in phases as money becomes available. 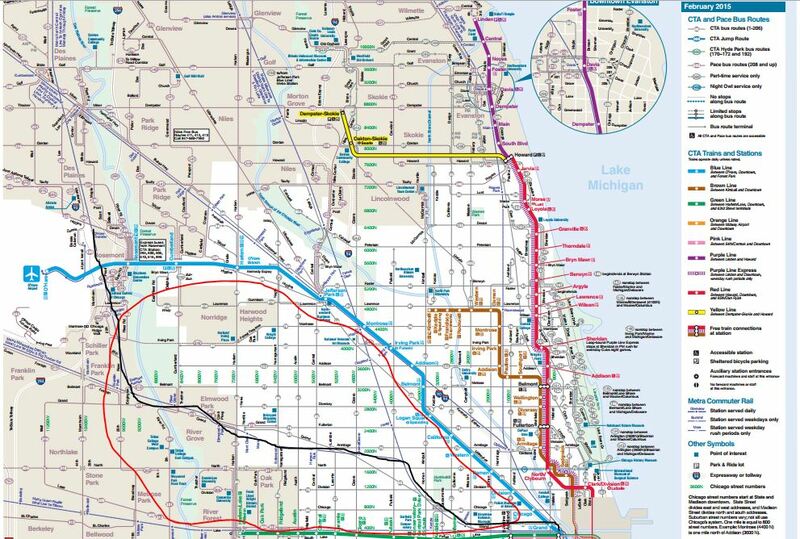 The first phase would be the downtown connector and electrification of the Milwaukee District-West and North Central Service (Canadian Pacific and Canadian National) tracks out to O’Hare. The entire distance would use existing right-of-way that primarily serves passenger trains, but sees significant freight traffic as well in some segments. I argued in my post on turning Metra into regional rail that the O’Hare connector would not be my first choice for a North Side connection to the Metra Electric District, but it does serve a significant need, and cost was a significant factor in my argument. 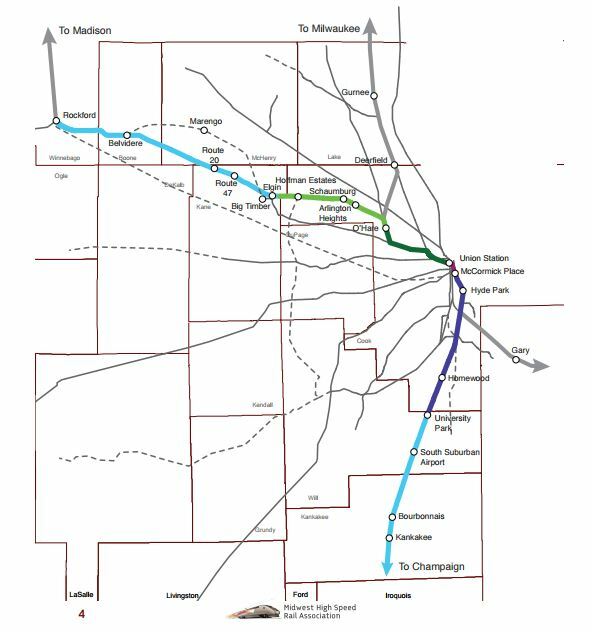 In fact, the MD-W line serves one of the largest areas of Chicago currently completely unserved by high-quality fixed-guideway transit (apologies for the poor drawing). Red outline is transit-less area, black line roughly (variations may be blamed on my crappy trackpad and broken mouse) traces the CrossRail path to O’Hare. Because of how industry, much of which has now moved out, historically clustered around the railroad tracks, there are plenty of opportunities for much-needed TOD projects along the MD-W path from the Loop to O’Hare. The adjacent neighborhoods aren’t among Chicago’s densest, but they’re diverse and still reasonably walkable and dense. Would the CrossRail proposal, and the O’Hare connection it offers, be my first choice for Chicago’s next major transit expansion? No, probably not. But it does offer significant new mobility potential for a large swath of the city, while potentially giving the business community the upgraded O’Hare connection they’ve always wanted. A CrossRail Chicago-like plan, assuming that it came with local as well as express service, could very well be a benefit to the larger population of Chicago in a way that other airport connectors have struggled to be. It would introduce the concept of regional rail upgrades to the extensive commuter network to the Chicago area, and indeed, has the potential to be the most promising regional rail project in the US, bettered in North America by Toronto’s efforts to turn Metrolinx into a Regional Express Rail. And it could do that while harnessing the energies of the business community, turning their self-centered desire to throw money around into something mutually and widely beneficial. And engaging the business community could–could–in turn bring support for a more extensive transit campaign, a strategy that the Transit Future campaign is clearly relying upon. But that’s a lot of ifs. It’s a lot of conditions to be met. And it’s a lot of uncertainty. There would seem to be a way forward that could both satisfy the globally connected dreams of Chicago’s business elite and provide public benefit, but it is a path fraught with potential disagreement, waste, and acrimony. I would, tentatively, support an O’Hare connector project that followed these lines, and perhaps even name it one of the city’s top transit priorities. Chicago would do well to remember the experience of Philadelphia, which spent 25 years building perhaps the nation’s most advanced piece of regional rail infrastructure with significant backing from the business community, including (of course) an airport connector. In the meantime, the (much more heavily used) rest of the system fell to pieces, and the Center City Commuter Tunnel has never been used to its full, transformational potential. A CrossRail-based O’Hare Connector might provide mobility to a large swath of Chicago that needs it. It might provide the vehicle by which the Metra Electric District finally becomes the rapid transit system it is destined to be. But if that’s going to happen, it’s going to take sustained work, cooperation, backbone, political savvy, and not a small dose of luck.